Join the United Corpus Christi Chamber of Commerce for the 2018 State of the Port Address, presented by Gulf Coast Growth Ventures. Learn about the latest Port Corpus Christi news and developments from the Chairman of the Port Corpus Christi Authority. Thank you, 2018 State of the Port Sponsors! *Doors open at 11:00 a.m. 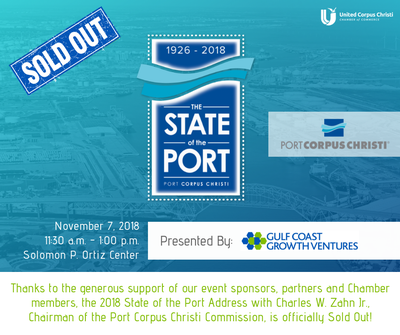 Thanks to the generous support of our sponsors, members & partners, the 2018 State of the Port Address is SOLD OUT! We look forward to a great event on November 7.